You can use watchlists to track the performance of funds, shares and other investments. You can create multiple watchlists, add and remove investments as you choose and even copy details of holdings from your account. If you use the HL app, your watchlists will automatically sync across devices simply by logging in. 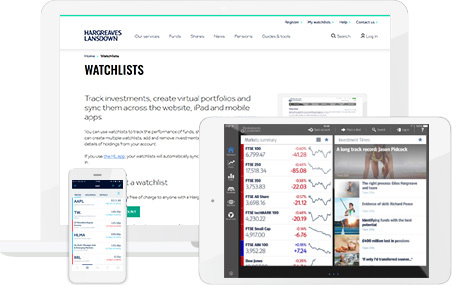 Watchlists are available free of charge to anyone with a Hargreaves Lansdown account. Simply log in to your account to get started. Don't have a Hargreaves Lansdown account yet? You can open a Fund & Share Account online in minutes.